For my final semester, Fall 2010, at the SJSU School of Library and Information Science (SLIS), I interned at the University of California, Berkeley’s Bancroft Library. I arranged and processed two collections and wrote finding aids for each one: the Dwight C. Steele Papers and the Gladys Worthington Papers. I am so glad to have helped make these collections accessible to researchers in the U.C. Berkeley community. As of April 2011, the finding aid for the Dwight C. Steele Papers (BANC MSS 2005/195 c) is now available on the Online Archive of California (OAC). 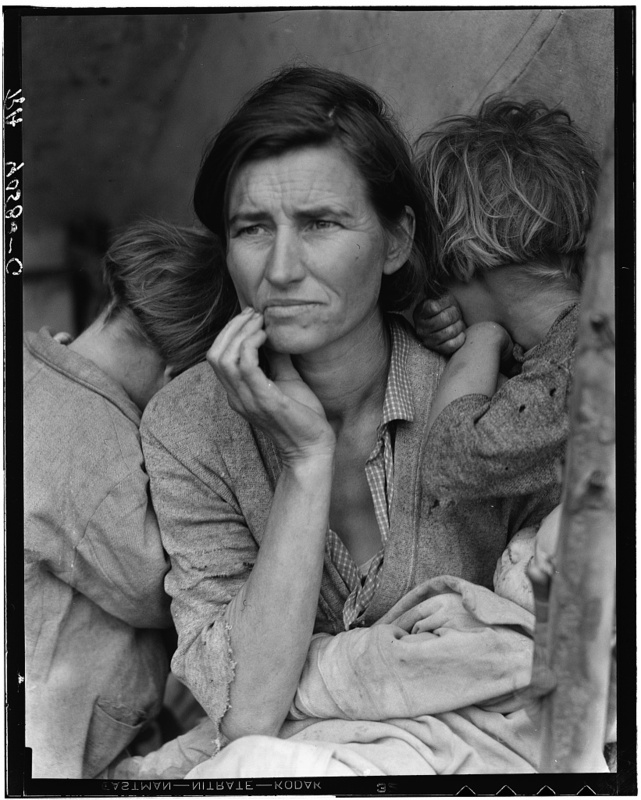 Researchers can contact the Bancroft Library for access to the collection. The U.S. Copyright Office, under direction from Congress is conducting a study on the “desirability and means of bringing sound recordings fixed before February 15, 1972, under Federal jurisdiction,” particularly as it relates to the ability of cultural heritage institutions to preserve and provide access to this class of recordings. For those of you not in the know, this class of recordings is not currently protected by Federal law, and instead is covered by a bevy of conflicting and confusing State statutory, criminal, and common laws. Unfortunately, this means that nearly no pre-1972 sound recordings are in the public domain in the United States. This is problematic for libraries and archives charged with caring for and ensuring continued preservation of and access to these recordings. This topic is near and dear to me, as it relates directly to my summer internship at the Graduate Theological Union’s Flora Lamson Hewlett Library, where I assessed intellectual property concerns and developed metadata requirements for the digitization of a pre-1972 sound recording collection. Further, I developed a research proposal on the topic for my Research Methods course. I appreciated the opportunity to submit my comments to the U.S. Copyright Office. The extended deadline for submitting comments to the U.S. Copyright Office was today, and replies to the comments will be open until March 2, 2011. Attached is my statement to the U.S. Copyright Office. So, I’m still reeling from the completion of my e-Portfolio (the culminating experience for my master’s degree) late Monday (yay me!). So my post will be brief. This site explores the new and evolving methods of digital preservation along with potential strategies for ensuring value–no less than our cultural heritage–is attributed to digital resources in the public sphere from individual, organizational, national and international levels. Changes in technology have led to broader cultural change including an information environment that is constantly in flux. This cultural transformation reflects changes in technology and within online environments. However, in order to best preserve information content and context, the transitive nature of information created, used, and stored digitally must be recognized and made part of the larger cultural awareness, so that our emerging digital, cultural, heritage can be preserved, and ultimately made accessible to current and future user communities. It is all a little dark web of me, as I haven’t yet finished my website that it is a part of, and it is a little rough around the edges, but I thought it would be nice to share anyways. My internship at U.C. Berkeley’s Bancroft Library is coming along. The manuscript collection I am processing, the Dwight C. Steele Papers, is coming along, and I am feeling good about my work. I will finish labeling the folders and cartons and work on the finding aid next time I am in. Then it will be time to move on to the next collection. Before I do, though, I realize I’ve learned so much through the processing of this first collection. The biggest difficulty I have had is in sticking to the institutional priority of “MPLP” or “More Product, Less Process” which reflects an approach to processing proposed by Mark A. Greene and Dennis Meissner (2005) published in The American Archivist. While Bancroft is using a modified Greene and Meissner approach, meaning there is flexibility in processing, with much more detailed work allowed on a case by case basis, my natural inclination is to be very detailed in my work, which typically takes too much time, considering the backlog of materials that needs to be processed. So, as I’ve gone through the collection survey and processing process, I’ve been forced to seek strategies to speed things along. Some of the time, this happens after the fact, so that on my next collection, I won’t make the same types of mistakes. Yesterday, while at the job site, I had to do some backtracking, as I was horrified to discover my collection had grown over the course of my processing due to extensive refoldering (the new folders were taking up more space than they were originally, as I wasn’t filling each folder as much as I should have been). This turned out to be unjustified by the time I had the collection arranged. As I’d been working, I painstakingly made chronological folders for each year for some series, as I planned to add to each folder and fill it as I processed. Unfortunately, the majority of these folders were not filled, some of which only had one or two documents inside. This turned out to be a waste of space and resources. So, in order to avoid adding another box or carton to the collection, I began to consolidate some of these folders and was able to fit the collection into the original space allotment. I may do a bit more of this before I create the finding aid and add the container list. The fewer individual folders I have, the easier this will be to do, and the more time I will save. Of course, backtracking takes time, too. But the lesson is learned, and will save me time both in creation of the finding aid and in the processing of future collections. In just a couple of work days, I will be started on the next collection and able to apply all that I’ve learned along the way. I believe I will be much more successful in adhering to MPLP. Further, I am excited that Mr. Steele’s collection will finally be accessible to researchers and the public. What a payoff. I get to see the collection move from a disorganized state, through to a neatly foldered and organized collection that will be of use to patrons of the Bancroft Library. My internship at U.C. Berkeley’s Bancroft Library‘s Regatta Storage Facility has continued in Richmond, CA, along with the three other interns working at the same site. Each of us is processing a different collection. Mine is the Dwight C. Steele Papers, which is comprised of 7 cartons, and two oversized boxes. Mr. Steele was a labor lawyer turned environmental lobbyist/activist. He was involved deeply in Bay Area and Lake Tahoe Region environmental causes (most activity is from the 1960s – 2000), through personal lobbying and work with groups such as the Save San Francisco Bay Association (also known as Save the Bay), the San Francisco Conservation and Development Commission (BCDC), Citizens for the Eastshore State Park, the Sierra Club, the Sierra Nevada Alliance, the League to Save Lake Tahoe, the Tahoe Regional Planning Agency, the Tahoe-Baikal Institute and others. The initial part of my internship was involved in surveying the collection and developing a processing plan based on the survey, and according to strict guidelines developed as a result of institutional priorities–the idea is More Product, Less Process or MPLP, an approach devised by Greene and Meissner to help assure access is prioritized when institutional backlogs are dominating holdings. The next phase–and I am still working on this part–is the actual arranging and processing of the collection. Unfortunately, strict deadlines weren’t given to us, and the processing plan form indicated I had much more time to work on this, as it was using non-MPLP time frames. Last Thursday, we were given a soft deadline to complete work on the collection by October 21, 2010. Technically that left only 16 hours of work. Yikes. I’m only 1/2 done now, and still have to produce a finding aid! Fortunately, I discussed my dilemma with my supervisor and was given another full day to complete my work on the collection. As a result, I am spending some time reviewing all of my survey notes and researching Mr. Steele’s connections and involvement so I can develop a revised strategy for completing the collection within the new time frame. This semester I’ll be one of four interning for UC Berkeley’s Bancroft Library, at the Regatta Storage Facility which is one of their off campus storage and processing facilities in Richmond, California. The site internship supervisor is David de Lorenzo (also an instructor at SJSU SLIS), although we do not work directly with him. I have been really impressed with the organization of the internship and the presentation of orientation materials and the level of support provided at the job site. On our orientation tour of the facility, David commented that Regatta is like the the warehouse from Raiders of the Lost Ark where the Ark of the Covenant is stored. I’d have to say I agree with his estimation, and would only add that it is a very modern version of the warehouse! Newly remodeled specifically to house museum (by David’s account there is a sarcophagus and a totem pole somewhere in the depths of the facility) and library materials (the Judaica librarian discovered a 1596? item printed in Bamberg, Germany in a box he was unpacking last Thursday), the facility is secure (we all have University issued badges that open the security gate and front door, and only have access to the portion of the warehouse storing Bancroft’s material–there are lots of locked doors and fenced off areas within the warehouse), with environmental controls for humidity and temperature, and it even has two bunkers built in for storage of volatile nitrate film. Needless to say, it is an exciting environment to be in. Our focus is processing archival collections, as one of the functions of the facility is as an archival processing center. The goals of the internship are quite clear, as the backlog of archival materials at Bancroft is problematic. The problem has developed over time, as 20th century collections produce so much paperwork, and historically the processing approach taken by Bancroft Library has been thorough and thus, time consuming. David de Lorenzo is now using a modified Greene & Meissner approach to processing archival collections known at Bancroft as “MPLP” which stands for More Product, Less Process (see the article More Product, Less Process: Pragmatically Revamping Traditional Processing Approaches to Deal with Late 20th Century Collections”). With this new approach, access to collections can improve greatly. With grant funding, the Bancroft has hired four full time survey archivists (for three years) who are assessing the status of collections at Bancroft and are now overseeing us interns. Each of us is starting out with two of the smaller high priority collections. Develop arrangement schemas and formulate processing timelines for archival collections while considering institutional resources and priorities. Apply archival survey and arrangement methods to unprocessed manuscript collections. Compare, select and employ appropriate conservation methods and materials for archival objects. Appraise collection materials for retention and disposition based on institutional policies, research needs and archival standards/guidelines. Facilitate information management and retrieval by designing and constructing descriptive finding aids and accurate electronic records using archival methodologies. To date, with only one week of the internship behind me, I have been focusing primarily on outcomes 1 and 2. For outcome 1, institutional resources and priorities have been made clear as described above, and I can see how it is important to fit processing into a timeline in order to best meet and follow through with these. I am processing the Dwight C. Steele (an environmental activist/lobbyist and labor lawyer) papers, which is comprised of seven cartons (although there are likely other materials associated with it, that I hope will be identified/delivered soon). For the survey I have a 16 hour timeline, and have completed cartons 1-3 already. I will tackle cartons 4-7 this Thursday, at which point I will be ready to create a processing plan and submit it for approval. I did struggle to stick with my timeline initially, as it is easy to want to go into too much detail at this early phase when it is actually more important to see the “forest for the trees.” However, I have a better sense of the pace I need to maintain now. Outcome 2 focuses on the survey and arrangement methods of unprocessed manuscript collections, and well, I am up to my ears in it! I am really glad to be getting the experience and look forward to looking at the collection in a more in depth way when processing and arrangement begin. 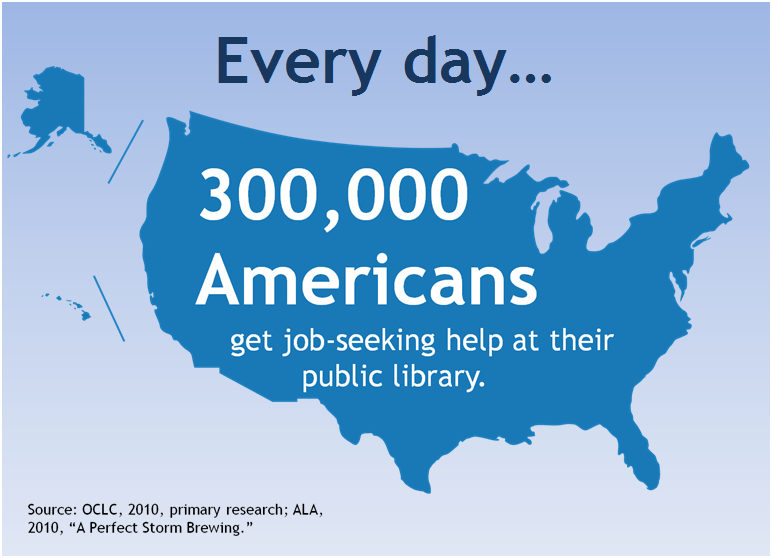 Did you know that 300,000 Americans visit public libraries daily for job seeking help? In economic times such as these, those facing the digital divide continue to turn to their libraries for access to the internet. Tough times lead to tough choices, and it seems likely to me that the digital divide has grown as income loss might lead some to choose to cancel services such as home Internet access. Cable and phone bills can be expensive, and when you are struggling to make ends meet, you cut back where you can. This means more people will turn to their public library (0r Internet cafe) in order to use on site Wi-Fi with a laptop, or use the machines provided by the library computer lab or work station. Those who aren’t using computers directly for job-seeking are able to stay in touch with friends and family, network, explore, learn, and contribute in the Web 2.o (3.0?) world. Computers are a necessity for job-seekers today, and public libraries provide access. For other public library factoids, visit OCLC‘s report How Libraries Stack Up: 2010. 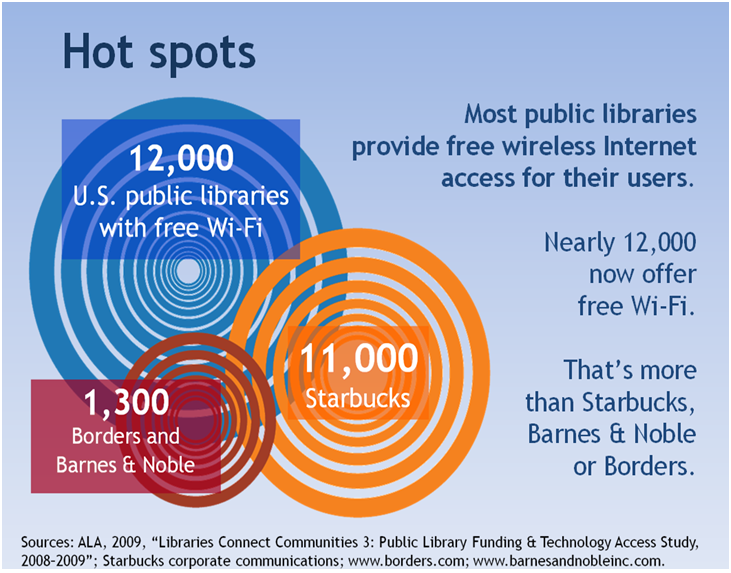 Did you know that more libraries provide free Wi-Fi than Starbucks? For more public library factoids, see OCLC‘s report, How Libraries Stack Up: 2010.